Cut 27 squares of mix and match fabric that are 5” square. This is a great opportunity to use some of your stash! These 27 squares are for the outside (rag bag) part of your handbag. Cut 27 squares of 5”alternative fabric for the inside of your tote bag. Batting – Cut 27 squares of batting (I prefer Warm & Natural©) that are 4” square in size. 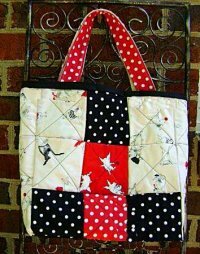 prefer for the inside of your bag because this tote is reversible. Layer each one of your squares as follows: 1 layer of fabric facing out, 1 layer of 4” batting, 1 layer of your lining fabric facing out. Sew all 3 layers in a cross pattern, leaving a 3/8” allowance as shown below. Sew your squares together, 3 squares at a time. After sewing your 3 squares, sew your 3 sets of 3 squares together to form the front and then do the same for the back. Leave a 3/8” seam allowance. Optional Pocket – If you would like, now is the time to add a pocket. Attach the pocket either on the bottom and sides of the “rag bag” side of your bag or the lining side, whichever you prefer. Leave the top open and sew a seam down the pocket, dividing it into 2 parts. Short side measures 7 ½” and the long side measures about 13½”. Attach the sides and the bottom of your bag. Attach the back. Cut 2 handles for your bag 6” wide by 25” long. Fold handles in on both sides then fold toward center again. Sew down each long side as close to the edge as possible. Fold under both ends of your 2 handles by about ½”. Position your handles about 1” in from each side and 2” down from the top. Attach handles in a cross pattern to your handbag. Trim extra threads off your bag. Wash in cold water on gentle cycle. Dry in dryer on low. Trim extra threads again. This is the finished product (the quilted side is on the left, the rag bag side on the right). 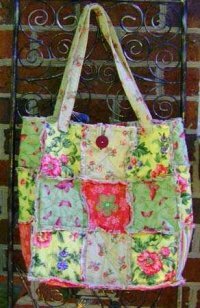 Henrietta's Handbags have simply hundreds of great patterns for making handbags. Why not have a look today?